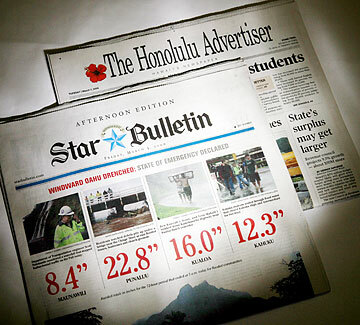 BOTH THE HONOLULU STAR-BULLETIN and Honolulu Advertiser engaged in tactical maneuvering in the months leading up to their split five years ago. The Advertiser beefed up its editorial staff, hiring, in some cases, out of the Star-Bulletin newsroom. "They were expecting to (get) us out of Dodge," said Dennis Francis, Star-Bulletin publisher who was an Advertiser executive back then. In December 2000 the Advertiser announced plans to launch an afternoon edition -- and David Black announced plans the next day for a morning edition of the Star-Bulletin. There were questions at the time about whether a market this size would support two daily editions by two papers. "It is very difficult to compete, as a smaller daily newspaper, against an entrenched competitor, which Gannett certainly is, with the Advertiser," according to John Morton, president of Maryland-based Morton Research Inc.
"We've gotten stronger every year. This past year, with the addition of the second MidWeek, has been our best yet." Both Gannett and the previous Star-Bulletin owner, Liberty Newspapers LP, had insisted that the Star-Bulletin was losing $10 million a year, so Black viewed the Advertiser's move to add a p.m. edition as predatory. It was one of many allegations. "Clearly, they're not doing this because they believe they can earn a profit," he said at the time. The Star-Bulletin has continued to publish its morning, afternoon and Sunday editions, while the Advertiser ceased publication of its afternoon paper in January of last year. At the time the Advertiser pulled the plug on its p.m. edition, its president and publisher, Mike Fisch, said it was never seen as a "long-term market opportunity," and he cited the 40-year decline of afternoon papers' circulation as reasons for the decision. The 22,000 customers receiving the afternoon Advertiser were switched to morning subscriptions. Only about 100 people were getting both the morning and afternoon Advertiser, Fisch said last year. Gannett has deep corporate pockets, but even so, the newspaper industry as a whole has "not fully recovered from the 2000-2001 recession," Morton said. "Advertising volume revenues have been sluggish. They're growing, but sluggishly." Publicly traded newspaper companies "own half the circulation" in the country, he said. In 2004, "speaking of newspaper operations alone, the average operating profit margin was 20.5 percent, which is certainly very strong," Morton said. "In 2005 it slipped and went down to 19.2 percent, but that is still a very high number, so even though the industry is viewed as being beset by the Internet and sluggish advertising, it is still a highly profitable business." Black's privately held Black Press Ltd. does not release financial information about the Star-Bulletin. Francis would not discuss financial topics, preferring to keep the hand he is playing close to the vest. But he did say, "We've gotten stronger every year. This past year, with the addition of the second MidWeek, has been our best yet."